I had plans to go out last night with a few Argentinian guys but ended up falling asleep in the hammock. I kind of regret it but I was so exhausted, I guess from being in the sun all day. But word has it the nightclubs are open 24/7 and people go out from like 2-7am. The beers are 12-14 USD. I was told it is the most expensive place in South America. I finally got a chance to sleep in this morning. I woke up, sunburnt, and had some hostel breakfast (corn-flake type things with yogurt). I started talking to some germans that were staying in my room and I forgot how it came up but it turns out my watch had the wrong date. There is timezone 1 and 2 on my watch and my timezone 2 I was using said it was the 10th instead of the 11th. So basically, my bus had left that morning at midnight, so I went online and had to book another ticket ($50 down the drain). I also commented to a couple Argentinans that the water tasted good, they then pointed out that I wasn’t supposed to drink it (clearly marked sign). Was a little nervous but lady at front desk said its OK if I’m not sick then I can keep drinking it. So drink it I did! I lazed around the hostel all day until about 4:30 when I had a city tour scheduled. I played a game of volleyball with the Argentinians and they invited me to go with them to some beach down the road but I didn’t really have time plus I was sunburnt so out of commission. It was tough there, I was the only English speaker I met. Many Argentinians or Uruguayans from a nearby city called Montevideo come there for vacation. Everyone was surprised I was “only” staying a couple days because most of them stay at least a week. I really wish I did have at least one more day though, to see another beach, city, or just relax more I guess. The city tour was 4 hours long. The guy came and picked me up at the hostel, it costed $30 US. Unfortunately the guide talked very little English so I couldn’t get too much out of what he was saying. 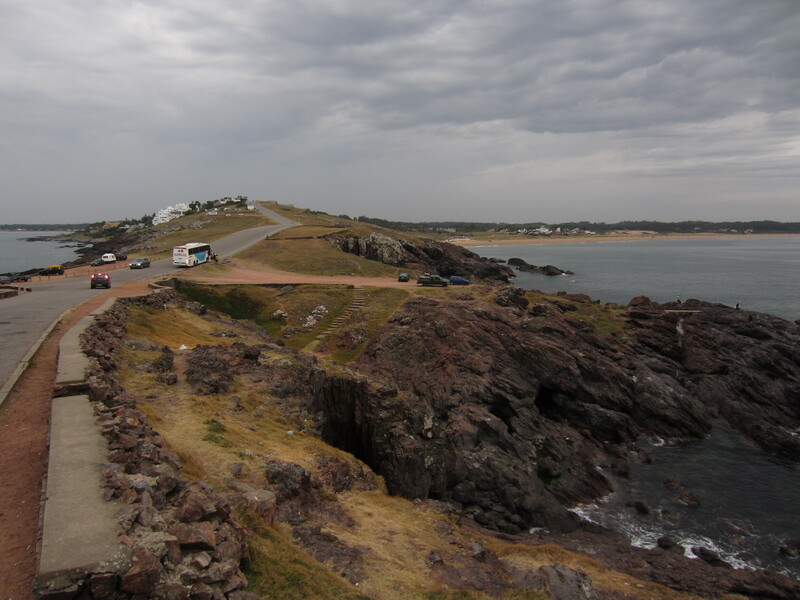 On the tour, I learned that the city of Punta Del Este is actually both a city and a state. Within it, there are different areas. 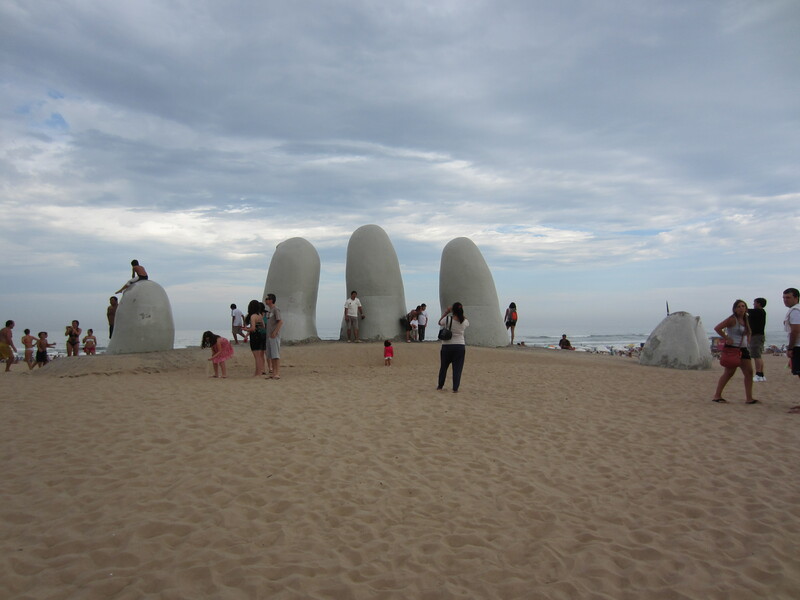 The highlights of the tour were seeing the giant hand in the sand, right by the bus station. 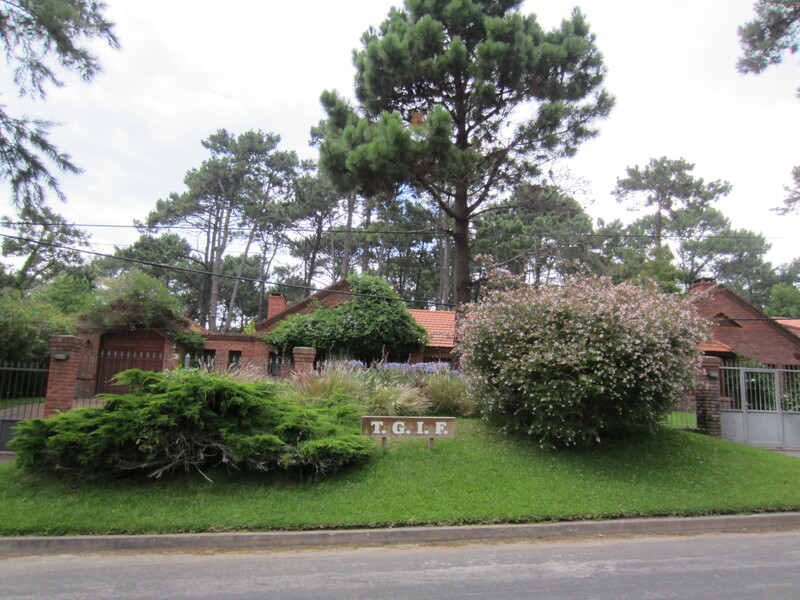 We also went to Beverly Hills, it is the richest area of Punta Del Este. Really nice houses, that have names not addresses. They are also not built in a typical grid format like a normal city but just random extensions and turns on roads. The guide said that to give an address, you write the bus stop number as a reference, then the road name, then the house name. In the middle of Beverly Hills we also went to a museum, Museo Ralli. 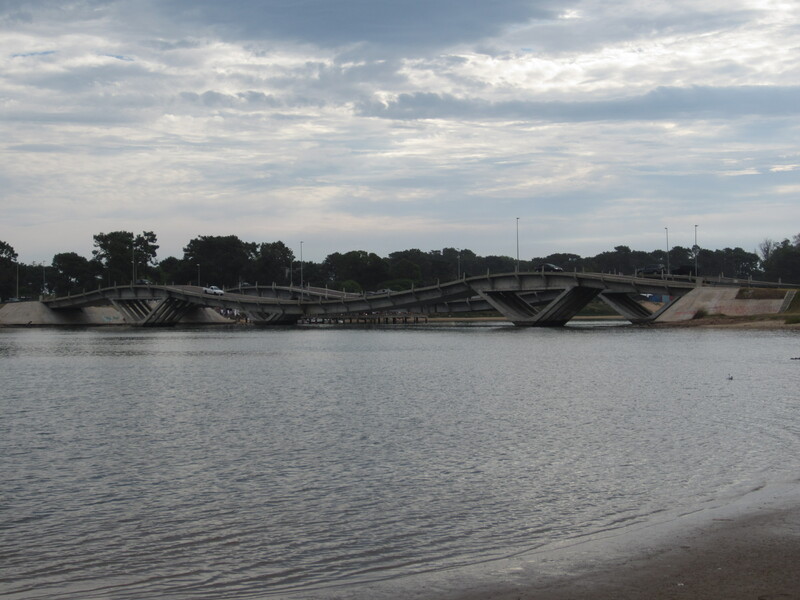 Punta Del Este is not the “real” Uruguay the Taxi driver said who is from a nearby city, it is a fake paradise build on wealth. There are 18,000 permanent residents and over half a million come only for the summer months of December to March. So most of the giant houses here are left vacant most of the year. Over 50% of them are owned by rich Uruguayans and Argentinians. The rest are owned by people from the States, Europe, etc. He said a lot of celebrities live there, he gave Bruce Willis a ride from the airport the other day and saw Angela Joe Lee on the beach. He said celebrities like it there because no one bothers them like they would in the US. 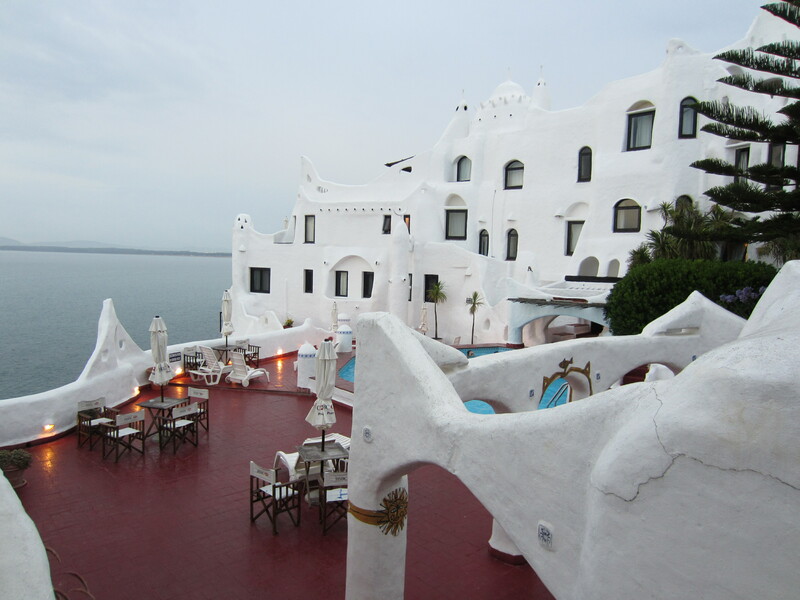 But the best part of the tour was Casapueblo in Punta Ballena. This place was built by a famous artist named Carlos Piez Vilaro. The place was very impressive, build into a hillside over the water like Macchu Piccu. Apparently the guy kept expanding on his house to help inspire his artwork. I wish I knew more information but I couldn’t understand the guide. They have a tour there for US $6 where you can look at his artwork and watch the sun set. Unfortunately, it was raining so we didn’t get to see the sun set but I bet it would have been amazing. So after the tour, I kinda caught up with some people I met but had to catch my bus at 12am. I showered up real quick and didn’t realize it but left myself really tight on time to catch my bus. I walked 10 minutes from my hostel out to the main road where apparently there were no bus stops I was just supposed to flag down a local bus to the station. One just blew right by me, which really sucked because I thought I was going to miss my bus back to Buenos because they ran every 15 minutes plus a 20 minute ride to the station. I started trying to hitch hike (I read in my guide book this is normal, and I saw a bunch of other people doing it). No one picked me up, not surprised (at this point I also noticed a FERRARI in front of a restaurant.. in South America.. WTF??). Luckily, a bus came and picked me up, in less than 10 minutes. 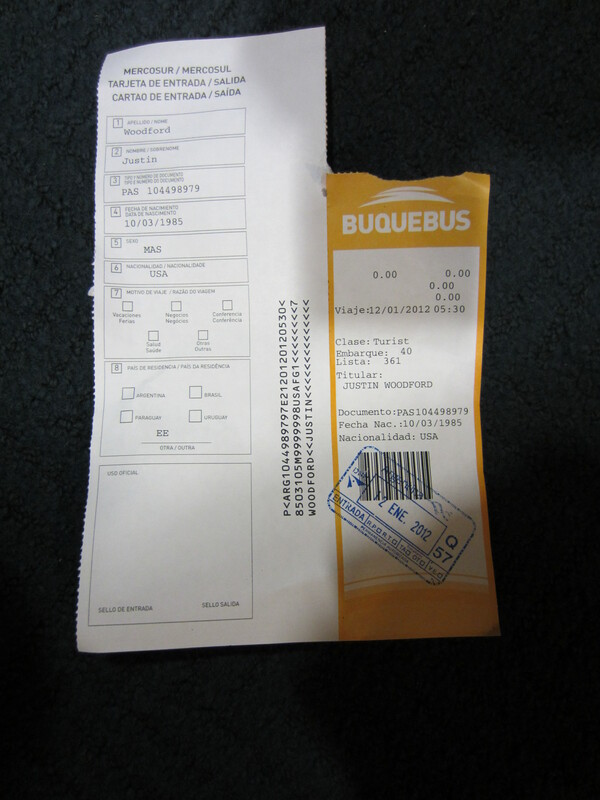 The bus costed 36 Uruguayan Pesos back to the station (<US $2) and I got to the station at 11:53pm for my midnight bus. It was easy to find the bus since the station was really small. But then the bus ticket guy tells me I am not on the list for the bus. He’s arguing with me, over what I thought he was saying was that my bus was supposed to be tomorrow night since the ticket said midnight, but turns out I actually bought the wrong ticket AGAIN. So I bought a ticket for the 11th and the 13th but tried to catch the bus on the 12th. No idea how I did that. Anyhow the guy let me on, think he felt bad for me. So after a 4 hour bus ride, where I slept the whole way, we ended up at the station in Colonia (the port city between Argentina and Uruguay) with customs and the ferry to Buenos Aires. The transfer was easier than I thought , and was very modern and organized. Went straight from bus to customs to the boat. 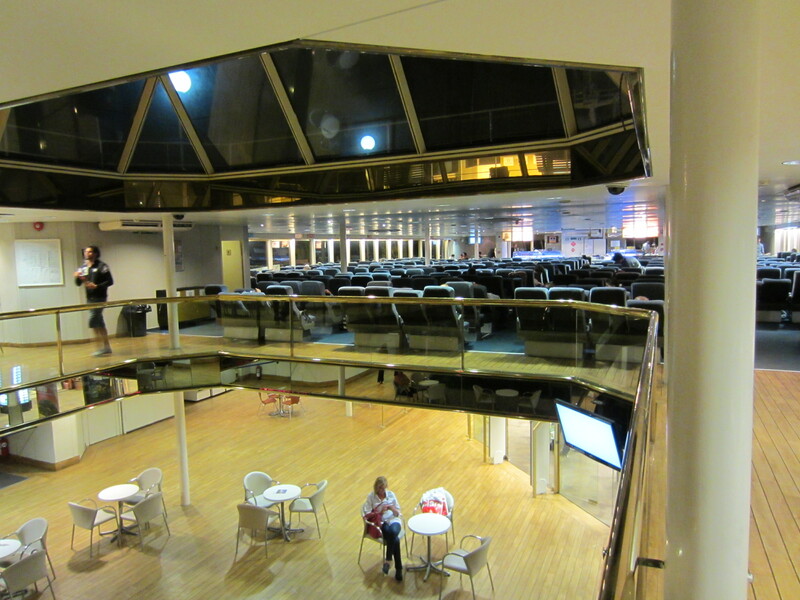 I couldn’t believe how big this boat was, it was the size of a small cruise ship, with first class on the first floor and tourist class on the 2nd floor. I slept this entire ride too.